WEST WINDSOR – Area residents are encouraged to bring their appetites to a culinary tasting event hosted by Mercer County Community College’s (MCCC) Culinary Arts program and featuring more than a dozen of the region’s finest restaurants. The event will be held on Wednesday, Oct. 15, from 6 p.m. to 8 p.m. in the MCCC cafeteria, 1200 Old Trenton Road, West Windsor. 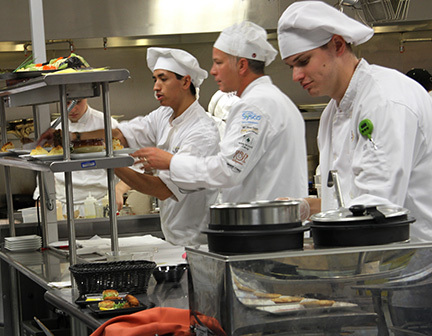 In addition to food prepared by area restaurants, MCCC Culinary Arts students – both current students and alumni – will be staffing tables and giving participants the opportunity to see them in action. Participating restaurants include Jersey Girl Café, Hamilton; Blue Bottle Café, Hopewell; Palace of Asia, Lawrenceville; Agricola, Jammin’ Crepes, Nassau Inn, Pure, and Small World Coffee, all located in Princeton; Sadie Cakes, Robbinsville; and Stone Terrace by John Henry’s and Terra Momo Bread Company, among others. The evening will also feature a silent auction, with many holiday gift items available. Tickets are $25 for MCCC alumni, students, faculty, and staff; general admission is $50. All proceeds from the event will benefit the Chef Anne Lumberger and Chef Sari Widmayer Pastry Arts Memorial Scholarship Fund. For more information, visit www.mccc.edu/hrim. Tickets can be purchased at MCCC’s Kelsey Theatre, or purchased online through the Kelsey Theatre ticket portal at www.kelseyatmccc.org. Current students and alumni of the MCCC Culinary Arts program will be on hand for demonstrations during a tasting event on Wednesday, Oct. 15, with proceeds going toward student scholarships. More than a dozen area restaurants will be represented.